Some photos and geekings from a scientist and all-round nerd. While hiking a section of the Appalachian Trail in Massachusetts I found this little guy on the path, and he was kind enough to pose for a photo. He's a cutie, only about 2-3cm long (you can see some leaves in the photo for scale), and has these distinctive red spots along his flanks ringed in black. With his orange colour he really stands out from the background, but it also tells predators he probably doesn't taste very nice and would make you sick if you ate him. I went along my merry way after snapping a few photos, and later on stopped at the side of a lake for lunch. Again I was keeping an eye out for wildlife and managed to snap a photo of another reptile swimming just under the surface. This guy though was much harder to spot with his olive-green colouration. He's very well adapted for swimming, with a blade-like tail and smooth shiny skin. Funnily though he also has these black-ringed, red spots along his flanks and he's about the same size as my orange friend above. I put it down to coincidence and continued on my hike. After getting home and going through the hundreds of photos from the 10-day trip, I remembered the two newts and set to figuring out what species I had seen. Googling "orange reptile red spots black rings massachusetts" brought me to the wikipedia page of the Eastern Newt (Notophthalmus viridescens), which turns out to be a very common reptile in that part of the world. What was strange was that the wiki page didn't just show a photo of the orange guy up there, it also had a picture of something strikingly similar to the green swimmer from the lake. Turns out I had unknowingly photographed two stages in the life cycle of the same species! Basically the orange fella at the top of the post is a juvenile land-dweller, sometimes known as a red eft or red-spotted newt. 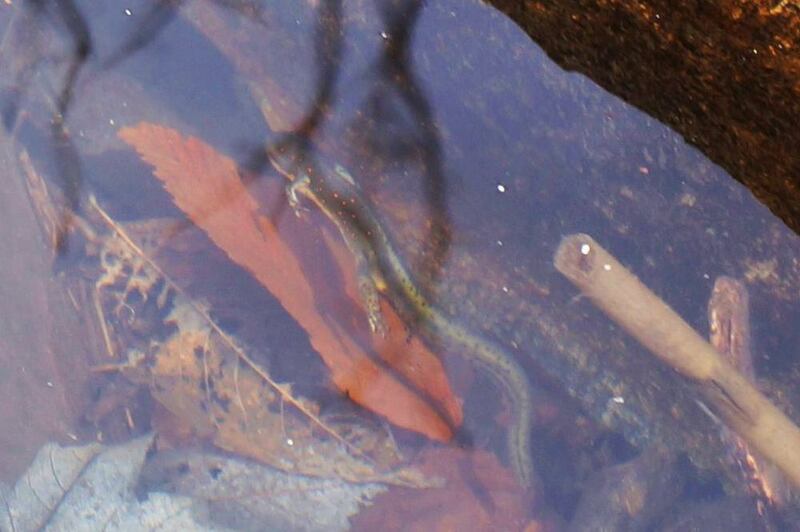 He hatches from his egg as a drab brown-green larva and spends a little time swimming around his home lake. Then, when he hits puberty he sheds his gills, grows lungs, his tail becomes narrower and he transforms into the bright orange-coloured "red" eft. As a typical teenager he now wants some freedom, so he leaves his home lake to find a place of his own. After two or three years of wandering he finds a cozy little lake and settles down, regrowing his gills and his blade-like tail and swapping his dry orange skin for some slimy olive drab (but he keeps his characteristic pattern of red spots). This is a pretty neat survival trait really, the juveniles are forced to migrate from one lake to another, bringing new genes with them and ensuring the diversity of the species overall. I'm sure most locals know all this stuff, but being an Irish tourist I think it's fascinating that an individual can undergo such radical changes over the span of a 12-15 year life, and the little guys are pretty adorable!